Maine Beer Company is sending out new beers on a torrid pace lately, at least when you compare it to their prior release schedule. We have had Another One, Weez and Red Wheelbarrow along with some brewery only pilots. For me the core Maine Beer Company offerings are still my favorites but it is nice to mix it up a bit. 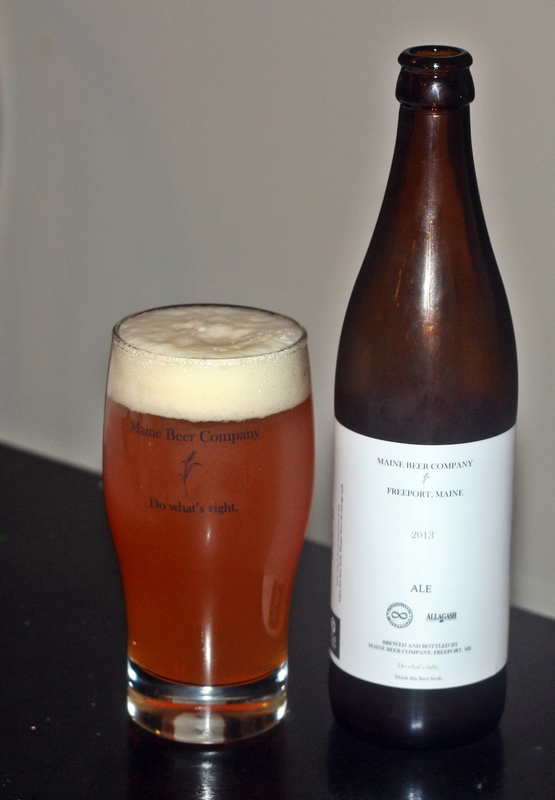 2013 is their anniversary ale brewed with Allagash and In’finiti. It is a blend of two different beers, one a Belgian pale ale and the other an American pale ale. This makes for a very interesting combination of flavors. Appearance is a very nice orange color with a solid off white head. This beer left some great lacing on the glass. Aroma is dominated by the citrus hops but there is also a bit of Belgian yeast smell in there. Taste was much better than I expected with a solid hop profile and just enough malt and Belgian yeast to balance things out and add another layer of complexity. 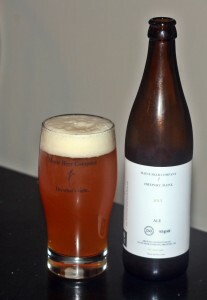 The collaboration between In’finiti, Allagash and Maine Beer Company worked very well in this anniversary ale. If you can find a bottle I recommend giving it a try. Brewers Description: Our 2013 Anniversary beer is collaboration amongst friends, Allagash and In’finiti Fermentation & Distillation. Given our focus on hoppy American ales and Allagash and In’finiti’s focus on Belgian-inspired ales, we thought it only natural to blend the two styles. The result is what you might call a hoppy Belgo-American Pale Ale. 2013 is actually a blend of two separate fermentations, one, with our American ale yeast and one with Belgian yeast (Allagash house strain and a Trappist strain preferred by In’finiti). The “American” version was dry hopped with Falconer’s Flight and the “Belgian” version with Saaz. Both were then blended together to taste. The result, a hoppy pale ale with notes of both citrus (American hops) and spice (Belgian yeast and continental hops). *This beer was only brewed once, in October of 2013, and will be available in bottles in most of our markets for a limited time, beginning 10/29/13. Please enjoy fresh.